Let a Sesame Street® furry friend help make your child's bedtime wishes come true, even before their head touches the pillow! In a calm, quiet environment, one of five Sesame Street® characters will join in on some relaxing stretches, a bedtime story, and a sweet lullaby before tucking your child in for the night. *Additional Sesame Street® character can only be reserved upon arrival at the resort's Sales Office. Please note that if booking online you must reserve at least 7 days in advance of your arrival. Ready, Set, Smile with Sesame Street®! 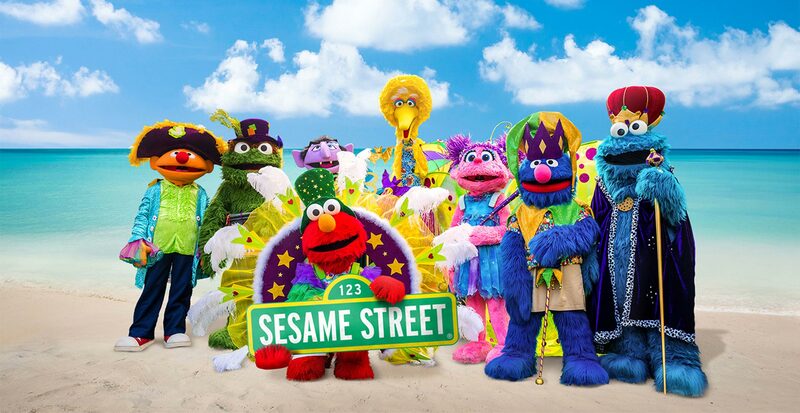 This special opportunity to meet Elmo & the Gang takes place in a unique tropical setting and it guarantees your child the ability to be photographed with all the Sesame Street® characters at one time by the Beaches paparazzi. So leave your cameras behind and let our photographers do the snapping at this 15-minute "Meet & Greet" with all your Sesame Street® friends! All characters participate except Julia. What goes great with breakfast? How about lots of fun with your favorite Sesame Street® friends? Enjoy a delicious buffet breakfast with Elmo and all his friends in a family-friendly dining environment. What makes a birthday extra special? Having a favorite friend from Sesame Street® there to help celebrate! Book a private party in a unique location on the resort and your entire group can enjoy delicious food and drink, as well as all the party fixings. All characters are available, except Big Bird, Julia, and Oscar the Grouch. *Please note that if booking online you must reserve at least 7 days in advance of your arrival. *A "child" is defined as newborn to 15 years of age. Character availability varies by date and by resort, and the times available for booking are provided on a first-come, first serve basis. All Sesame Street® character appearances are subject to change without notice. Any reservations for Sesame Street® VIP Packages other than those made at the Sales Office at the resort must be booked at least 3 days in advance of your arrival, and 7 days in advance of your arrival if you are booking the "Night Night, Sleep Tight" or "Birthday Parties" packages. Adding additional characters to the packages that provide this option must be done at the Beaches Resort Sales Office on resort.